It's no secret that this is one of my favorite books of all time for many reasons--the story, the illustrations, the life lessons, the magic, etc. etc. I know I'm not alone though. This book has been around for 85 years, and I've found glowing reviews about it everywhere. Of course I should mention that I have found a couple of critics, but after all their big words, what they've really had to say is that "it's too sentimental." Ummm...okay. Perhaps I should warn you parents...the rabbit cries once in the book. This brings me back again to the point I made about The Giving Tree last week. The best books make us feel something and give us something with which we can identify. They show us that we are not the only ones who have the same feelings...whether it's happiness or anger or sadness or loneliness. Tell me what your favorite book is, and I bet it's not one that's void of emotion. The fact is that we're human and our kids are too, and books that show a variety of emotions teach them that it's okay to feel. So, I do agree with the critics, The Velveteen Rabbit is sentimental in that respect, but I don't think it's "too sentimental" whatever that means. If you're looking for a heartwarming story with some important underlying lessons, I highly recommend this book. Children's self-esteem grows as they experience the security of having a parent or other caring person read aloud with them. Children learn listening skills, vocabulary, and language skills. Children learn concepts and information about the world around them. Children learn positive behavior patterns and social conduct. This is why I started this blog and why I've become obsessed with building it and researching and giving recommendations for quality books that will help you instill the joy of reading in your child. If you're unfamiliar with United Through Reading, check them out. They have two excellent programs for Military families and for children of incarcerated parents. Just a reminder that tomorrow is the last day to sign up for your chance to win a copy of Cynthia Rylant's book, When I Was Young in the Mountains ! Thanks to all who've signed up so far. If you haven't signed up yet, click here and add a comment to the post, making sure to leave me your email address. Good luck! So why has a book about a boy and his bunny remained so popular and well-loved for 85 years? Why do I still get the warm fuzzies when I think about this book? I’ve pondered these questions this week as I’ve been writing about the book, and I’ve come to realize that this book is everlasting because it teaches some important lessons. It’s much more than a book about a rabbit and the boy who loved it. It’s a story about unconditional love and real beauty--beauty that comes from the inside. The rabbit is teased first by the more modern and “high tech” toys in the boy’s room because he has no cranks or springs or other mechanical parts. Then he’s teased by the real rabbits because he doesn’t look like a real rabbit. This makes the rabbit sad and self-conscious. I don’t know how old children are when they start worrying about the way they look and how others perceive them, but I do know it starts very early. I am not looking forward to the day when my daughter comes home feeling bad about herself because she was teased, but I am not too naïve to think that it won’t happen. All children are teased at some point by someone, and unfortunately, some more than others. So, I think all children who read this book can identify with the rabbit and how he feels when he’s teased. However, the book soon teaches you that beauty is really not about how you look…it’s about who you are inside, and when someone loves you for who you really are, the way you look doesn’t matter. The old, shabby skin horse and then the old shabby velveteen rabbit prove this point. The boy’s uncle and the boy respectively loved their toys so much that the toys became real to them, and even when they were old and beat up and not as new and shiny as the other toys, they were still the most-loved toys. I remember in my Calculus class in college, I was grouped with a girl whose left side of her face was severely scarred by a dog attack when she was 8 years old. The scarring was so severe that I couldn’t help but notice it every time I talked to her. Then as the semester went on and I got to know her as a person, I didn’t notice the scars as much. One day my roommate asked me what the name of the girl with the scarred face was and it took me a minute to figure out who my roommate was talking about. I knew her as “my friend Britney”, not the girl with the scarred face. In The Velveteen Rabbit, the boy doesn’t notice that the rabbit has become old and shabby because he loves him so much, and it teaches us all to remember to look on the inside and see people and ourselves for who we really are. Another feature that has made this book endure is its magic. The toys come to life when the boy is asleep or away from his room. This theme has been repeated over and over in books like the Raggedy Ann and Andy series and movies like Toy Story. There’s just something about getting inside the heads of toys to see what they do and what they talk about when you’re not around. I remember when I was little, I used to pretend to sleep hoping and praying that I would see my toys “wake up” and play. I was even convinced they could tell the difference in my breathing, so I would breath deeply and heavily and was always bummed when I woke up the next day because I actually had fallen asleep and missed out on the adventures. Look at tales like Pinocchio and Cinderella that have been around forever. Kids love magic especially when there is a happy ending, and in the Velveteen Rabbit, there is a very happy ending. The magic nursery fairy turns him into a real bunny. What more can you ask for? There are many many other lessons and quality elements in this book that make it so well-loved, but alas, I’m writing a blog, not a novel. I look forward to the day when I can share this story with my little girl and see her enjoy it as much as I did. Please tell me--why do you love this book? Margery Williams Bianco wrote The Velveteen Rabbit in 1922 when she was 41 years old. A professional writer since the age of nineteen, she wrote a number of children’ sbooks and novels, but none achieved the fame or the classical status of The Velveteen Rabbit. Born in London, Williams Bianco developed a passion for reading and writing at an early age and carried that with her throughout her lifetime. She and her family moved to the United States when she was 9 years old, where she lived until she was 19 years old. She then returned to London to start her writing career. She married her husband Francisco Bianco three years later, and had two children. She put her writing career on hold to become a full-time mother. Margery and her family left the war-torn Europe and settled in the United States in 1918 and by 1922 had resumed her writing career, publishing her first American book, The Velveteen Rabbit. Margery spent the rest of her life writing children’s books and young adult novels. Her most notable book after The Velveteen Rabbit was Winterbound, a young adult novel that was a runner-up for the Newbery Medal in 1937. She died in 1944 at the age of 63. I normally don't like to change my review schedules, but these two books were waiting in the mail for me when I got home today. I read them as soon as I could, and I knew I had to share them with you so you could get them in time to share with your children for the holidays. Both of these books were just released in September of this year, so if you haven't had a chance to see them, be sure to check out my blog next week. The All-I'll-Ever-Want Christmas Doll written by Patricia McKissack and illustrated by Jerry Pinkney. IT'S CHRISTMAS, AND NELLA is beside herself with excitement! She and her sisters have been given a real gift - a beautiful Baby Betty doll. But it's hard to share something you've waited your whole seven-year-old life for, and Nella grabs the doll for herself. It isn't long before she discovers that a doll can't do the fun things she and her sisters do together. So, as Christmas day fades, Nella shares it with her sisters. Set in the Depression era South, here's a heartwarming story that captures the essence of the holiday. A Song in Bethlehem written by Marni McGee and illustrated by Jason Cockcroft. Book description: ONE CHILL EVENING IN BETHLEHEM, young Naomi hears of an amazing sight: at the inn's stable, there are three men rich as kings, with rubies round their necks and gold on their fingers. Eager, Naomi rushes to catch a glimpse. But by the time she arrives, the men are gone. Yet Naomi discovers a different treasure: a baby boy, with parents kind and wise. And when she receives the gift of a flute from the baby and his family, her life is transformed forever and her world is full of music. It is a night full of wonders. It is the first Christmas. A Song in Bethlehem is a lyrical and stunning tale of the strength of love and compassion, filled with all the magic of Christmas. Grab your copy and join me next week! Favorite Toy: Have your child pick his/her favorite toy and describe what it looks like, why it is his/her favorite, where he/she got it, etc. Talk about all of the different toys in the story. Point to the pictures on the pages, and ask him/her to name each toy. Animals: The book features rabbits and a toy horse. Have your child talk about his or her favorite animal. Identify other animals he/she likes. Find a picture book with animals and point to each one, naming them as you point. Ask your child to make the sound the animal makes. For beginning readers, spell out the name of the animal. Emotions: Talk about the different emotions the Velveteen Rabbit felt, and when he felt each emotion. Ask your child to talk about a time when he/she was happy, excited, sad, etc. Friendship: Ask your child to describe his/her friends and what they like most about each one. Tell your child the same about your friends. Gifts: Discuss gifts and ask your child to talk about his/her favorite gift. First published in 1922, The Velveteen Rabbit begins with a boy who receives a stuffed rabbit for Christmas. The boy enjoys the rabbit for a little while but then puts it aside for other toys. The rabbit is soon forgotten and placed in the toy cupboard only to be snubbed by the fancier mechanical toys. The rabbit’s only friend is an old shabby Skin Horse who tells him that you become “real” when you are truly loved. One day the boy misplaces his china dog. For the next few seasons, the rabbit never leaves the boy’s side until the boy becomes ill with scarlet fever. When he recovers, he is sent to the seaside and all of his “diseased” toys, including the rabbit, are left to be burned. As the rabbit is waiting to be burned, he sheds a real tear. Suddenly, a magic fairy appears and turns him into a real rabbit. When I was a little girl, I remember reading this story over and over again. The beautiful images, the vivid language, and the magic make this heartwarming story of a little rabbit who only wants to be loved one of my favorite stories of all time. It’s also a great story to put you in the holiday spirit. If you’re looking for a nice story to read with all of your children, I highly recommend The Velveteen Rabbit . I tried to read this to my daughter last night, and she was entranced by the images for a while. Then she tried to rip the pages out. Not a reaction to the book—she’s in the “ripping” phase. She tried to rip the head off one of the characters in an Alice in Wonderland last week. Luckily, I found a number of board book versions of the Velveteen Rabbit on Amazon. Perhaps I will put one on my wish list. The holiday season is already upon us, and it's also the busiest season for charitable donations. I did a search on Charity Navigator and found a multitude of charities that promote literacy through reading and education. Here are a few of the top-rated charities. Reach Out and Read (ROR) is a national non-profit organization that promotes early literacy by giving new books to children and advice to parents about the importance of reading aloud in pediatric exam rooms across the nation. Founded in 1992, First Book is a national organization that gives children from low-income families the opportunity to read and own their first new books. We provide an ongoing supply of new books to children participating in community-based mentoring, tutoring, and family literacy programs. Building with Books (BwB) engages American youth through in-class and after-school programs in 108 high schools. Students also volunteer in their local communities and help build schools in developing countries. BwB has built 230 schools in villages worldwide, providing more than 100,000 children and parents with access to education. The mission of United Through Reading is to facilitate supportive relationships for children through families and friends reading aloud with them. Our vision is that all children will feel the security of caring adult relationships and develop a love of reading through the read-aloud experience. Founded in 1989 as Family Literacy Foundation, we provide programs that encourage parents and other community members to read aloud with young children (ages 0-5) for the educational and emotional benefits to all involved. The mission of Beginning with Books is to increase meaningfully the numbers of children who become capable and enthusiastic lifelong readers. This is accomplished through research-based programs respectfully offering the information, materials, skill development, and encouragement that enable parents and other adults to promote the literacy development of the children in their care. These are just a few organizations I found. Visit each charity's website for more in-depth information and donation information. See their ratings or find more charities on Charity Navigator. It's been brought to my attention that some of you are having trouble viewing the blog using Internet Explorer. Seems like it's happening mostly with version 7.0. I'm making some tweaks to the code and trying to figure out the problem. Please email me and let me know if you continue to have issues. This is one of my favorite children's books of all time. I remember reading it over and over again when I was a little girl. Looking forward to hearing what you have to say next week! Have a fantastic weekend! Here are some of my favorite Thanksgiving books for children. Hope everyone has a wonderful holiday! If you liked The Giving Tree, check out these books by Shel Silverstein. If you haven't had the opportunity to get to know his work, I encourage you to do so. Every kid I know has been delighted with his funny and lighthearted poetry. I'm posting this tonight because my little chica has a nasty virus. She's sleeping right now, so I thought I'd write while I was coherent and not covered in projectile vomit. I keep waiting for me or the hubby to get sick any minute. Anyway, here are some arts and crafts ideas that fit nicely with The Giving Tree. Enjoy! Divide a piece of construction paper into four squares. Have your child draw the life cycle of an apple, one stage in each square (Seed, tree, blossom, fruit) If you have apple seeds, glue them on the paper. Leaf Rubbings: Gather leaves from different trees. Place the leaves on a piece of paper and put another piece of paper on top of the leaves. With crayons, rub the leaves until the veins show up on the paper. Leaf Poster: Take a walk with your child and gather leaves from different types of trees. Also gather other things you find that may have fallen on the ground like pine needles, acorns, and twigs. Glue different types of leaves on a poster and label the type of tree each one came from and decorate the poster with the other items you’ve found. Parts of a Tree: Draw a picture of an apple tree and label the different parts, such as leaf, branch, twig, and trunk. Twig Vase: Finally, if you're feeling particularly ambitious, check out this twig vase activity I found online. Here are some learning activities you can use with your child as you read The Giving Tree. I'd love to hear your ideas. Trees: Talk about the uses for trees, from oxygen to wood to paper; Identify the items in your house that are made of wood. Walk around the neighborhood or in a park and collect leaves from trees; identify different types of trees. Apples…get different kinds of apples, in different colors. Have him/her taste the different apples and identify his or her favorite. If you are a teacher or have a lot of kids, make an “apple pie chart,” charting everyone’s favorite. Talk about the different products made from apples, such as applesauce, apple juice, apple butter, and apple pie. Talk about the difference between happy and sad. Talk about other emotions. If you have the space and means to do so, plant a tree in your front or back yard. Explain the environmental benefits of planting trees. Write 5 words that begin with the letters in apple. Let me know what you tried and how it went! The story begins with a tree and boy who are best friends. The tree loves the boy, and the boy loves the tree. The tree gives the boy everything he needs from a vine to swing on to apples to shade to sit under. As the boy grows older, he visits the tree less and less, and when he does visit, he wants more and more. Because the tree loves him so much, it gives him everything he asks for until nothing is left but a stump. The boy leaves and returns many years later as an old man. The tree/stump tells him it has nothing left to give, and the boy/man says all he needs is a place to sit. The tree is happy again and gives him a place to rest. I chose this book to review because it's been one of my favorites for many years, and I absolutely love Shel Silverstein. Until I heard from some of you and did a little research, I had no idea that there were so many strong opinions about this book. Some love it, some hate it. Some say the boy is greedy and selfish and that children readers learn a horrible lesson. Others say it's the story of unconditional love...the kind of love a parent has for a child. Then there are those who compare the tree to Christ and his self-sacrifice. My opinion? It's a great book...yes, it may not be the happiest book in the world and children could feel sad and sorry for the tree when they read it. However, I'm of the thought that we can't shelter our kids from the real world and always read them tales of happy bunnies and frogs and princesses who live happily everafter. Of course no parent wants to see thier children hurt or sad. I dread the day when my daughter comes home sad because someone else made fun of her. I dread the day when she gets rejected by a boy or doesn't get picked for the lead role in a play or something else she has her heart set on. But you know what? I also know that it will happen. She will be disappointed. She won't always be happy, and there will be times when she will be sad. I already got a taste of this the other morning when I dropped her off at daycare, kissed her goodbye, and heard her screaming for me down the hall as I left the building. Will I read the The Giving Tree to her when she gets older? Absolutely. It makes you think. It sparks questions. It's beautifully written and tells a touching story of love, friendship, and yes...the dreaded disappointment we've all experienced. Of course, that's my opinion. I'd love to hear yours. Check back tomorrow for some reading tips and learning activities. I've found a lot of great book blogs, and Joy at one of my favorites, Thoughts of Joy, is hosting a 2008 Young Adult Challenge. Since I'm so busy with the baby, I haven't found as much time to read as much as I would like to, so I thought I'd commit myself to reading books in the upcoming year. What better way to do it than with a challenge! In addition to my weekly reviews, once a month, I will read and review a longer young adult book. I chose to do a challenge with young adult books for a couple of reasons: 1) This is a blog about children's literature, and I want to give parents and older kids some good recommendations, and 2) Young adult books are for the most part shorter than books for adults, and I'll be much more likely to fit them into my busy schedule. Join me....this should be fun! If the idea of a challenge sounds fun, but you have young kids, check out the Young Reader's Challenge. Becky at Becky's Book Reviews designed it for kids 12 and under. This would be a great way to get your kids excited about reading and the perfect opportunity to read with them! I have two paperback copies of Cynthia Rylant'sWhen I Was Young in the Mountains (Reading Rainbow Books) available to two readers who would like to participate in our December 17-21 review of this fabulous book. Cynthia Rylant's enduring favorite "When I Was Young in the Mountains" is the tale of her own childhood growing up in the Appalachian mountains of West Virginia. The gently repetitive text details her everyday life, from swimming in a swimming hole (even if there were snakes!) to taking a bath to drinking cocoa made by her grandmother. Each page starts off with, "When I was young in the mountains . . . " By the final page, we see that not only did Ms. Rylant appreciate her low-tech, memory-making childhood, but she wouldn't have traded it for anything. Diane Goode's softly colored illustrations beautifully dovetail with the text, whether she's showing a river baptism, a nighttime trip to the "johnny-house" after too much fried okra, or a stint at the water pump. It's a lovely ode to the simple life, and to being happy with what you have instead of worrying about what you don't have. To sign up, please comment on this post by Friday, November 30th. The only thing I ask from our lucky winners is that you comment on the book at least once during the week we review it. I'll do a drawing on December 1st and randomly pick two winners. Make sure I have your email address so I can contact you and arrange shipment if you are one of the winners...either include it in your comment or email me at thewellreadchild@gmail.com. Bloggers, feel free to mention this giveaway on your blogs! I absolutely love this book, so even if I don't draw your name, you'll have plenty of time to get the copy in time to participate in our December 17-21 review. Based on what I've heard from some of you already about this book choice, next week could get pretty interesting! Okay, so it may not have held my daughter's interest for a week, but she's very young. I've heard from some of you who have older kids who say they have loved the book. One mom even said her daughter had to have her own butterfly-themed room because of the book. Overall, this book is a great book for small children who are building their language and reading skills. It's not a book that teaches a powerful lesson or that is particularly heartwarming, but if you're looking for a book that will make your child smile and teach him or her a few new words or concepts, this book will do the trick. It's definitely special...otherwise, it wouldn't have sold 22 million copies over the last 38 years. Last night was the fourth night we read the book, and I have to say, I think we’re all “caterpillared” out. Throughout the week, my daughter found the holes in the book and had great fun poking her fingers through them until one finger got caught. Then she wasn’t so happy. She was fine...her finger was only stuck for a brief moment. She continued to be entranced by the big orange sun, but last night was a different story. She pushed the book around for a while and then starting crawling after our terrified cat. Perhaps it was just one of those nights because she also had no interest in applesauce, her most favorite thing in the world. I know many children love their favorite stories read to them over and over and get bored by the ones they don't love. I think my daughter may be too young to have a favorite right now, but it is possible for her to already be bored by something? What are your bedtime routines? Do you read the same story every night until your child asks for a different one, or do you mix it up from night to night? When can you tell it's time for a new book? Check back tomorrow for a final assessment of the Very Hungry Caterpillar. If you liked this book, I'm going to give some suggestions for similar books. I'm also going to provide a sneak peek into next week's book, The Giving Tree by Shel Silverstein. When I was little, my brother, sister, and I would go to my Aunt Marian's and Uncle Dave's house around the holidays and paint Christmas ornaments. We'd help Aunt Marian make a huge batch of Rice Krispie treats and spend the day painting ceramic ornaments. We got to choose our own colors and paint our names on the back, which I thought was really cool. I remember coming home with those ornaments and proudly showing my mom who immediately hung them up on the Christmas tree. Those ornaments are still on my mom's tree today, and every time I visit over the holidays I remember the days we spent with Aunt Marian painting, eating snacks, and chatting. I am by no means an artist, but I still love arts and crafts. Today, I scrapbook and make homemade soaps and make my own Christmas ornaments out of beads. Even though my stuff is probably not the prettiest, most well-crafted stuff out there, I get great enjoyment out of creating something from nothing. It's also a great stress relief. While my daughter is too little right now, I hope to create memories with her and spend time doing arts and crafts. When I was a teacher, I always had some sort of art project when we were studying a book. I was always amazed at the ways some of my students expressed themselves through art. It never failed...in every class, my most disruptive students always created beautiful art projects. They just needed some other outlet to express themselves. That's why I'm such a firm believer in giving kids different ways and methods to learn. Here are some fun Very Hungry Caterpillar arts and craft projects. Egg Carton Caterpillars: A very inexpensive project, you'll need a cardboard egg carton halved, pipe cleaners, wiggly eyes, and paint. Let your child paint the egg carton to create the body of the caterpillar. Let him/her choose the colors. Some kids will stick with green to look like the caterpillar in the book. Others may want a purple or red caterpillar. Punch holes in the egg carton and place pipe cleaners through them to make antenna and legs. Again, let your kids choose the colors. I've seen caterpillars with all black legs, all yellow legs, and multi-colored legs. Finally, glue the wiggly eyes on the caterpillar. They can also paint a mouth on the caterpillar. Caterpillar Books: Staple some blank paper (plain or construction paper) together to make a book. Have your child create his/her own caterpillar book. It can be as simple or as elaborate as they want to make it. I always got huge pieces of different colored felt at the craft store and let students cut out their own shapes to include in their books. Butterflies: You'll need construction paper, beads, sequins, glue, scissors, Popsicle sticks, and markers/crayons/colored pencils, etc. I like the different colored Popsicle sticks in the craft store. Find a butterfly pattern and trace it on a piece of construction paper. If your child is little, cut out the pattern yourself. If he/she is bigger, let him/her cut it out. Have them color the butterfly and glue beads or sequins on the wings. When the work of art is complete, glue the bottom to a Popsicle stick. They can hold the stick and make the butterfly fly. Another tip is to find different sized patterns and have your child create multiple butterflies if he/she is having lots of fun. They can even tape the butterflies on their walls to decorate their rooms. Check out this butterfly finger corsage. The post includes a butterfly template. Google, “The Very Hungry Caterpillar Learning Activities,” and you’re sure to find a lot of different activities. When I was an English as a Second Language instructor, I actually taught this book to my students because of the simplicity of the words and the many opportunities for learning the English language. My students loved the book, its pictures, and were able to pick up a few new vocabulary words. Here are some of the activities I’ve used as well as some good ones I found on the web. Because children mature at different ages, I'm not going to give recommended ages for each activity. You know your child best, so try what you think will work. Most of all, HAVE FUN! Days of the Week: The caterpillar pops out of his egg on Sunday and builds a cocoon the following Sunday. Use this book to introduce or reinforce the days of the week to them. You can do things like list the days in order, ask your child to tell you what the caterpillar ate on a certain day, or have your child repeat the pronunciation of each day of the week. For beginning readers, break the words into syllables and have your child sound each one out. It could also be a good time to introduce them to the “th” sound since you’re covering Thursday. Wednesday will probably confuse them, so explain that the first “d” is silent. If they’re more advanced readers, you may want to introduce other silent letters. Colors: The illustrations in the book are very colorful, so go through the book, asking your child to name the colors you see on the page. For older kids who are learning how to read, ask them to spell the names of the colors. Food: Have them name the foods they see on the page. If they know the different food groups, have them classify the different foods. Numbers and Counting: Count all of the food. Point to the numbers on the page. Ask questions like, "How many strawberries did the caterpillar eat?" Metamorphosis: Talk about the life cycles of the butterfly. Have your budding artists draw the different stages on a piece of construction paper drawn into fours. A very hungry caterpillar emerges from an egg and spends an entire week feasting on all kinds of foods, including strawberries, a lollipop, and a piece of pie. As he eats through each food, he also eats holes in the book big enough for little fingers to fit through. At then end of the week he’s a very full caterpillar with a bellyache. He eats a leaf to relieve his indigestion and builds a cocoon where he sleeps for two weeks. At the end of the second week, he emerges as a beautiful butterfly. This short and simple story is chock full of learning opportunities from days of the week, to counting, to metamorphosis. The words are easy enough for a small child to understand the story line and for a beginning reader to get through with little difficulty. The adorable and colorful illustrations engage even the youngest children. My eight-month old daughter is fascinated by the big orange sun at the beginning of the book and the big fat caterpillar after he eats all of the food. She bangs on them with her fist, so I recommend the board book version for younger children because it’s sturdier. Older children will probably like the standard version better since it looks like a “real, big kid book.” By reading it just twice to my daughter, I anticipate this being a favorite book for at least a few more years. I’d love to hear your impressions. Eric Carle’s illustrations are collages of hand painted tissue paper. The result—delightful one-of-a kind pictures that will make your child (and you) smile. This book has been translated into over 30 different languages and has sold more than 22 million copies worldwide. Come back tomorrow to get some reading/learning tips for enjoying this book with your child. If you have a review of The Very Hungry Caterpillar, leave a comment with your link, and I'll post it here! Starting on Monday, I'm going to be devoting an entire week to one book. Each day of the week will have a different focus, so be sure to check out the entire week. Next week, we're going to cover The Very Hungry Caterpillar by Eric Carle, a classic story about a caterpillar who turns into a butterfly. For the next few weeks, I'm going to start with some classics that you probably already have on your shelf, but I've provided links on the left of the page so you can order the titles from Amazon if you don't have them. I've posted the titles for the next four weeks, so grab your copy from your bookshelf, Amazon, or the library and join in the conversation! Looking forward to talking with you! I'm always on the lookout for books that feature characters in different cultures, and this heartwarming book is a true gem. 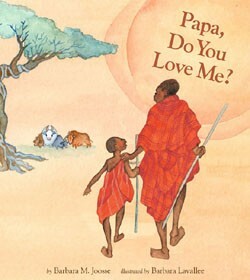 A companion book to Joosse's Mama, Do You Love Me?, a young boy, "Tenderheart," tests his father's love for him with a series of questions and scenarios. ("How much do you love me?" "How long?" "What if I fell asleep and the hyenas killed my birthright cow?") After each question, Papa reassures his tenderheart that he loves him unconditionally. The book features Barbara Lavallee's beautiful illustrations depicting the Maasai culture of Kenya and introduces children to a culture they'll most likely find to be different than their own. While my daughter is too young to understand the meaning of the book right now, I was especially touched by the theme that no matter what happens in life, no matter what mistakes a child makes, his/her parent will not stop loving him/her. I also love the fact that the book uses many native Maasai terms and even includes a glossary at the end. Combined with the touching theme, beautiful illustrations, and rich depiction of the Maasai culture, this book is a must-read for parents and children. Reading tip: There are many opportunities for learning in this book. Check out this teacher's guide for children in grades 2-4. This is a classic storybook I actually received in a new parents' kit from my doctor's office when my daughter was born. In the book, a little bunny rabbit is getting ready for bed and says goodnight to everything around him. Because my daughter is so little, she can't understand the theme of the book, but she does enjoy watching me point at the pictures and name everything I see on the page. Reading Tip: Parents who have trouble getting their little ones go to bed swear by this book. One mom I know reads the book to her son and then walks around his own room saying goodnight to everything in the room. She says her last step is to place her son in his crib, give him a kiss, and have him say goodnight to his little stuffed lamb. Unless he's sick, he always falls asleep shortly after. Do you have a review of Goodnight Moon? Leave a comment with your link, and I'll post it here! The final line, "As they held you close, they whispered in your open, curving ear, 'We are so glad you've come! '", brought me to tears as I whispered it into my own baby girl's open, curving ear. I've read this book multiple times to my daughter since then, and every time I read it, that last line brings tears to my eyes. It helps me remember that no matter how stressful my day has been, I have this beautiful little girl in my life. Point to all of the animals on the pages, name them, and count them. Now that my daughter is older, she loves to follow my fingers and touch the animals on the pages even though she doesn't understand what I'm saying yet. We have the "board book" version of this book which is sturdier for smaller babies. My mother used to read to me every night, beginning when I was just a little baby. By the time I was four, I had my favorite books memorized and "read" them to my family. My Aunt Marian gave a set of children's classics books when I was in the fourth grade, and I remember reading those over and over until the pages started falling out. Growing up in a small Southern town, there weren't a lot of opportunities to experience different cultures and places, so I relied on books to take me to different places and to teach me the importance of tolerance, patience, and diversity. The result: my creativity soared; my vocabulary soared; I learned how to accept people who didn't look like me or who didn't come from the same walk of life. Now, as an adult, I have a thirst for learning new things, and I know I have my mother and Aunt Marian to thank for cultivating the love of reading and learning in me. I'm not sure they know what an impact they've had on my life. Now I'm a mother of a seven month old little girl, and since she was born, I've been reading to her. Already, she loves looking at the pictures and listening to me read in funny voices. With TV, and video games, and computers, I believe we need to expose kids to words and let them create their own visuals instead of always having everything placed in front of them. We need to praise and applaud imagination and cultivate a thirst for learning and reading. Don't get me wrong, I love technology. I love my computer, and I love to watch TV, but as a parent, I feel that I must expose my daughter to all different types of media and give her the opportunity to create her own images of the worlds and characters she reads about. Plus, there's nothing like curling up with a good book on a rainy afternoon.